* The positioner controller PEPC - 10 is used in connection with a pressure transmitter potentiometer and Servo motor drive feedback potentiometer to modulate the firing with respect to the boiler Set pressure. * Up to three positioners controllers can be controlled from one pressure transmitter potentiometer . * The positioner controller can be mounted in any position in a dry location, e.g control panel. * For panel or wall mounting the controller has to be built into the housing. * Before connection the unit it has to be checked, if the available supply voltage corresponds with the voltage Given on the positioner lable. 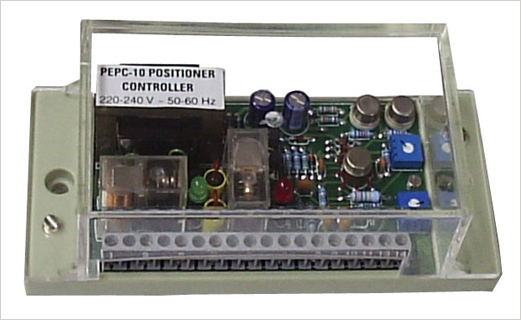 * The positioner controller PEPC 10 is a P - controller. The position of the pressure transmitter potentiometer GW (0% - 100%) is compared with the position of the burner feedback potentiometer R W (100% - 0%) built Into the servo motor drive. When a deviation exists in the transmitter potentiometer the positioner controller. Give the corresponding control signals to the motor drive until the position balance is established. Transmitter and feedback potentiometers with a nominal value form 130 to 2000 ohms can be used. * Run transmitter drive in to one limit position (0%) i.e. connect manual potentiometer to 11,13, & 14 of PEPC - 10 Equal to transmitter potentiometer value. * Check if servo motor drive runs into the other limit position. (100%) or High Flame. * Run transmitter drives into the other limit position (100%) and cheek the Servo motor drive run to Low Flame.